Charles was born in a military family but has spent the majority of his life on the coast of North Carolina. 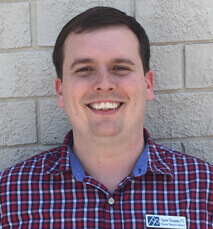 He graduated from West Carteret High School in Morehead City and then decided a few years later to attend PTA school at Craven Community College in New Bern graduating in 2016. Charles spent a short time working in a local skilled nursing facility before making the change to outpatient therapy. In his spare time, you can find Charles spending time with his wife Chelsea and friends as well as participating in activities at his local church where he teaches the 2 & 3 year old Sunday School class. He and his wife hope to have children of their own in the next few years! Charles also enjoys reading, running, and has recently began learning to play the piano.